This cake was on every menu in the 70s and is still a favourite today so you can guarantee it will be enjoyed by all your guests. Use fresh cherries when in season. Heat the oven to 180°C, 160°C fan, gas 5. Grease and line 2x 20cm round sponge tins with baking parchment. Place 100 ml hot water in a small pan and add the chocolate and butter and heat gently until melted. Remove from the heat. Place the flour, sugar, cocoa powder and baking powder in a mixing bowl. Beat in the eggs, then pour in the chocolate mixture, beating until smooth. Divide the mixture between the two tins and bake for 30 mins until just firm in the centre. Allow to cool for 10 mins then turn out and allow the cake to cool on a wire rack. To make the cherry filling, place the cherries, sugar and 2 tbsp water in a small pan and heat gently for 5 mins until the cherries are just tender. Stir in the liqueur. Place one cake flat side up on a serving plate. Spoon the cherry juices over the cake and allow to soak in. 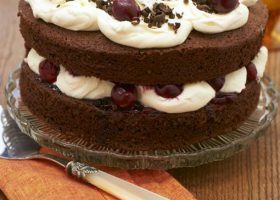 Spread the cake with jam and top with most of the cherries reserving a few for decoration. Whip the cream until just thick and spread half over the cake, top with the second cake. Spoon the remaining cream on top and sprinkle with grated chocolate. Arrange the cherries on top and serve chilled.